BACKGROUND AND PURPOSE: Identifying occlusion location is crucial for determining the optimal therapeutic strategy during the acute phase of ischemic stroke. The purpose of this study was to assess the diagnostic efficacy of MR imaging, including conventional sequences plus time-resolved contrast-enhanced MRA in comparison with DSA for identifying arterial occlusion location. 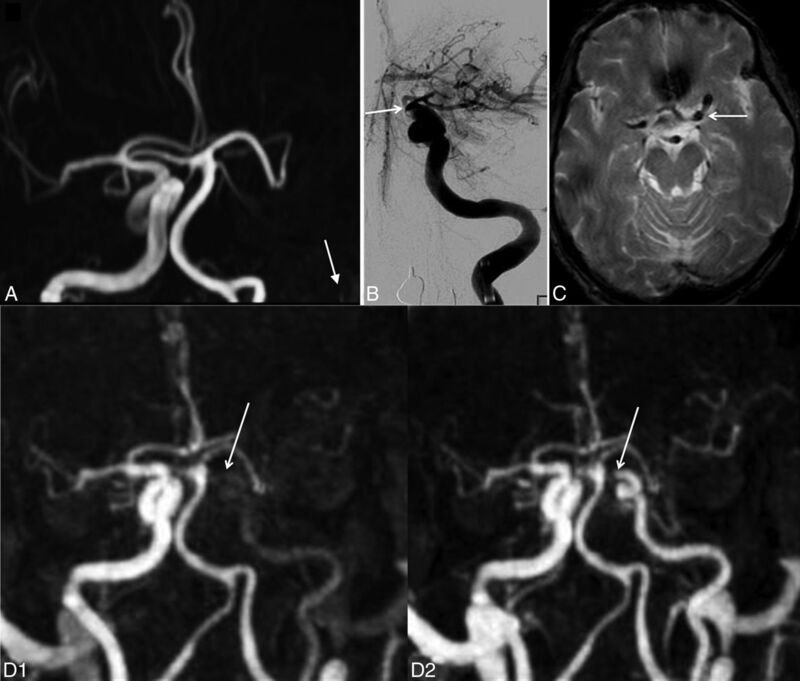 MATERIALS AND METHODS: Thirty-two patients with 34 occlusion levels referred for thrombectomy during acute cerebral stroke events were consecutively included from August 2010 to December 2012. Before thrombectomy, we performed 3T MR imaging, including conventional 3D-TOF and gradient-echo T2 sequences, along with time-resolved contrast-enhanced MRA of the extra- and intracranial arteries. The 3D-TOF, gradient-echo T2, and time-resolved contrast-enhanced MRA results were consensually assessed by 2 neuroradiologists and compared with prethrombectomy DSA results in terms of occlusion location. The Wilcoxon test was used for statistical analysis to compare MR imaging sequences with DSA, and the κ coefficient was used to determine intermodality agreement. RESULTS: The occlusion level on the 3D-TOF and gradient-echo T2 images differed significantly from that of DSA (P < .001 and P = .002, respectively), while no significant difference was observed between DSA and time-resolved contrast-enhanced MRA (P = .125). κ coefficients for intermodality agreement with DSA (95% CI, percentage agreement) were 0.43 (0.3%–0.6; 62%), 0.32 (0.2%–0.5; 56%), and 0.81 (0.6%–1.0; 88%) for 3D-TOF, gradient-echo T2, and time-resolved contrast-enhanced MRA, respectively. CONCLUSIONS: The time-resolved contrast-enhanced MRA sequence proved reliable for identifying occlusion location in acute stroke with performance superior to that of 3D-TOF and gradient-echo T2 sequences. Contrast-enhanced MRA can improve intracranial artery and SAA analysis. With improved contrast and less sensitivity to flow dynamics compared with 3D-TOF, this technique achieves optimal performance in detecting arterial diseases20⇓–22 and is being increasingly used in conjunction with brain imaging techniques for acute stroke cases.14 However, contrast-enhanced MRA is limited because it provides only a single static acquisition restricted to the early arterial phase, and slow-flow dynamics can cause pseudo-occlusions to appear upstream of the steno-occlusive lesion.23,24 Recent time-resolved contrast-enhanced MRA (TR-CE MRA) sequences appear to come closest to DSA imaging used in depicting arteriovenous malformations or dural arteriovenous fistulas25,26 and theoretically take advantage of arterial filling dynamics,27 with the option of late phases, thus avoiding the lack of contrast filling of cervical arteries upstream of the intracranial occlusion. This prospective study sought to assess the diagnostic performance of 3D-TOF, GRE T2, and TR-CE MRA in the identification of occlusion location, compared with DSA as the standard reference, in patients referred for MET in the acute phase of stroke. We obtained both institutional review board approval and informed consent for this study, which complied with the Health Insurance Portability and Accountability Act. From August 2010 to December 2012, 33 consecutive patients who fulfilled the eligibility criteria were prospectively enrolled. The inclusion criteria were as follows: age older than 18 years, MR imaging diagnosis of acute cerebral ischemic stroke based on diffusion imaging, referral for MET within 6 hs of symptom onset for anterior circulation occlusion, proximal thrombus detected by MR imaging, and time between MRA sequences and DSA <3 hs 30 minutes. The exclusion criteria included hemorrhagic lesions that were visible on MR images or comorbidity with poor prognosis. Data acquisition was performed on a 3T MR imaging system (Achieva; Philips Healthcare, Best, the Netherlands), which is the first-line imaging technique available 24/7 in our center. It was therefore possible to initiate optimal management without delay.12 The imaging protocol consisted of parenchymal brain imaging sequences (axial DWI, GRE T2, and FLAIR) and angiographic sequences (3D-TOF and TR-CE MRA). The MRA acquisition parameters are provided in Table 1. The total average acquisition time for all MR imaging sequences was 12 minutes. The TR-CE MRA sequence was based on a k-t Broad-use Linear Acquisition Speed-up Technique (BLAST)–accelerated 3D sequence, performed without moving the patient, with a whole-body birdcage coil used as a receiver.29,30 This technique provided wide coverage, from the aortic arch to the M3–M4 segments of the MCAs, with high temporal and spatial resolution.30 The acquisition slabs were positioned by using a low-resolution phase-contrast MRA that had been performed earlier. A fixed volume of a 15-mL bolus of gadoterate meglumine (Dotarem; Guerbet, Aulnay-sous-Bois, France) was administered intravenously at 1.5 mL/s with an automatic Spectris power injector (Medrad, Indianola, Pennsylvania), followed by a 30-mL saline flush, without a bolus-tracking acquisition. Maximum-intensity-projection images of angiographic sequences were automatically generated, as with 3D-TOF. Diagnostic prethrombectomy DSA was performed as the standard of reference for SAA and intracranial artery analysis. All DSA examinations were performed by a neurointerventionalist with >5 years' experience on a biplanar system (Allura Xper; Philips Healthcare) with the patient under general anesthesia by using the femoral artery approach. 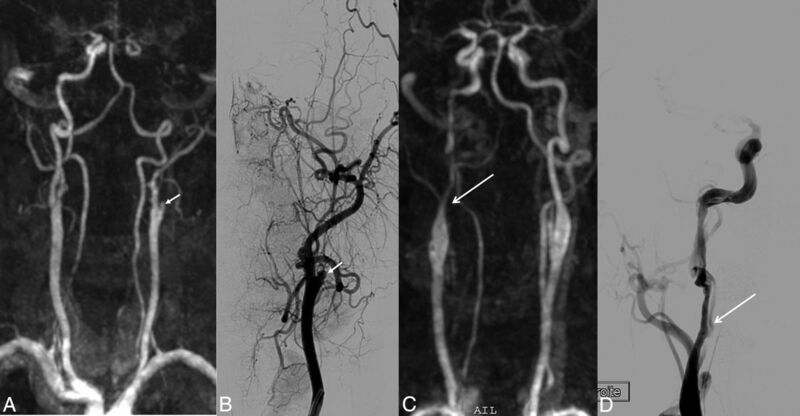 Angiographic images were acquired at 2 frames per second by using an automatic iodinated contrast medium injector at 6–8 mL/s for intracranial arteries and 2–4 mL/s for SAA (fluoroscopic guidance). The 3D-TOF, GRE T2, and TR-CE MRA sequences were reviewed on a specially designed imaging workstation (Extended MR WorkSpace 2.6.3; Philips Healthcare), which displayed native images and 3D MPR and MIP images. Two neuroradiologists, J.-C.F. and H.R., with 10 and 5 years' experience, respectively, were blinded to the DSA and clinical findings to independently evaluate the 3D-TOF and TR-CE MRA sequences. Any disagreements were discussed to reach a consensus. DSA was evaluated by 1 observer blinded to the other findings, by using frontal and lateral series on the target artery to define the standard of reference for the intracranial occlusion location and SAA stenosis quantification when applicable. In the event of tandem occlusion, both occlusion levels were reported. Patients were studied in randomized order. The diagnostic performance of both MRA sequences (TR-CE MRA and 3D-TOF) and the GRE T2 sequence was assessed and compared with DSA in terms of intracranial occlusion location. The diagnostic performance of TR-CE MRA was assessed and compared with DSA with regard to SAA stenosis detection. The images were assessed in terms of diagnostic performance and image quality. The location of the intracranial occlusion caused by the thrombus was defined as follows: for both MRA (3D-TOF and TR-CE) sequences, the site of complete stoppage of the arterial flow; and for the GRE T2 sequence, the proximal portion of the susceptibility vessel sign. The ICA segmentation used for occlusion location was defined according to previous classifications,31,32 giving rise to the cervical/extracranial segment (ExCICA), intrapetrous plus intracavernous segment (IICA), and supraclinoid segment (SCICA) (Fig 1). The M1 and M2 segments of the MCA were defined by standard practice guidelines. Supra-aortic artery stenosis was classified according to the semiquantitative SAA stenosis severity scale that is typically used in symptomatic patients,33,34 namely, none or moderate (stenosis, <50%), severe (stenosis, >50%), and occluded (complete stoppage of the arterial flow without downstream flow). 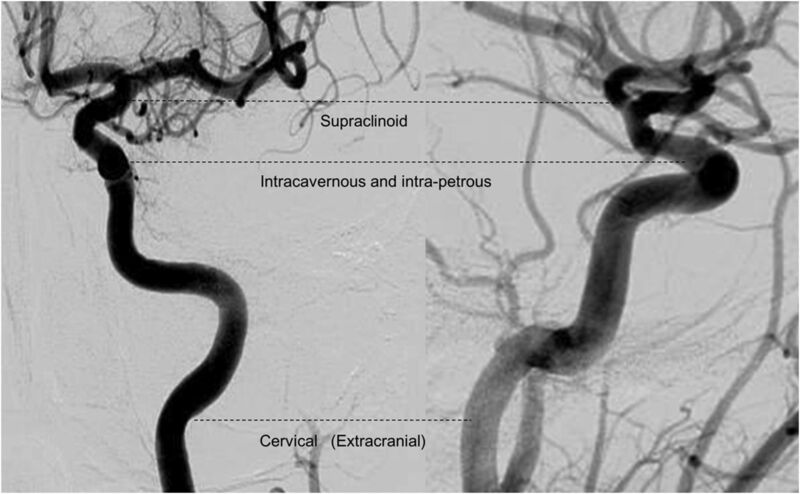 ICA segmentation used for the occlusion-level definition derived from Gibo et al, 1981.31 The internal carotid artery is divided into supraclinoid ICA, intracavernous and intrapetrous ICA, and cervical/extracranial ICA. The contribution of the dynamic nature of TR-CE MRA was assessed by quantifying the number of phases that elapsed between the phase yielding maximum signal intensity within the nonpathologic arteries and the phase yielding maximum signal intensity directly upstream of the occlusion location. The image diagnostic confidence index of both MRA sequences for SAA and intracranial arteries (Fig 1) was evaluated according to a modified diagnostic confidence index scale27,30,35: nondiagnostic (vessel borders not definable), fair (vessel borders scarcely definable, inhomogeneous vessel signal), good (good delineation of vessel borders with slight irregularities, homogeneous vessel signal with slight artifacts), and excellent (sharp and complete delineation of vessel borders, homogeneous vessel signal without artifacts). The statistical analysis was performed by using SPSS software (IBM, Armonk, New York). After recoding categoric variables as ordinal variables, we evaluated occlusion level differences with MRA sequences and GRE T2 compared with the reference imaging standard (DSA) by using a 2-tailed Wilcoxon exact signed rank test, with a statistically significant difference assumed for P < .05. To quantify the intermodality agreement of MRA sequences, comparing GRE T2 with DSA, we calculated the κ coefficient, 95% confidence intervals, and percentage agreement. Finally, interobserver agreement for MRA image diagnostic confidence indexes for the major intracranial arteries was determined. Of the 33 patients initially included in this study, 1 patient was later excluded due to a technical problem that occurred on gadolinium administration during the TR-CE MRA sequence, resulting in nonopacification of the SAA and intracranial arteries. The final number of patients included was 32 (On-line Table), with 21 men and 11 women (mean age, 64.9 ± 14.8 years; age range, 29–88 years). This number included 19 (59.3%) who had previously undergone IVT, 12 of whom had MET as a rescue therapy (if no substantial clinical improvement was seen 1 h after IVT).28 Two of these patients had a tandem occlusion. The mean time between MR imaging and DSA was 126 ± 35 minutes. For patients who underwent IVT, the mean time between IVT and DSA was 120 ± 33 minutes. Artery occlusion was diagnosed for all patients on the basis of the 3D-TOF and TR-CE MRA sequences, whereas GRE T2 only provided a diagnosis in 26 of the 32 patients (81.2%). Interobserver agreement for occlusion location was considered good for TR-CE MRA (κ = 0.72; 95% CI, 0.53–0.91) and excellent for 3D-TOF (κ = 0.86; 95% CI, 0.62–1). A 2-tailed Wilcoxon exact signed rank test revealed significant differences in the occlusion level among 3D-TOF, GRE T2, and DSA (P < .001 and P = .002, respectively), whereas there was no significant difference between DSA and TR-CE MRA (P = .125). Agreement between both MRA sequences and the GRE T2 sequence with DSA is shown in Table 2. The primary discrepancies between 3D-TOF and DSA were found when the occlusion was within the SCICA or M1 segments when using DSA, as opposed to the more proximal location within the IICA or even cervical/extracranial segment seen with 3D-TOF (Fig 2). The few discrepancies observed between TR-CE MRA and DSA occurred when the occlusion was within the M1 or M2 segments of the MCA when using DSA, with TR-CE MRA showing the occlusion more within the M1 segment of the MCA or in the SCICA (Fig 3). In patient 11, agreement between TR-CE MRA and DSA and discordance with TOF. A, 3D-TOF frontal MIP image shows complete occlusion of the left ICA from the IICA to distal segments of the left MCA. No data were available on the patency of the ICA proximal to the IICA segment (white arrow). B, Frontal DSA shows opacification of the left ICA up to the supraclinoid segment (white arrow). C, GRE T2 axial image displays a susceptibility vessel sign in the M1 segment of the left MCA. D, Frontal MIP TR-CE MRA shows patency of the left ICA up to the SCICA in the last phases (white arrows). In patient 1, disagreement between TR-CE MRA and DSA and discordance with TOF. A, 3D-TOF frontal MIP image shows complete occlusion of the right ICA from the IICA to distal segments of the left MCA, with a doubt about the patency of the ICA proximal to the IICA segment (white arrow). B, Frontal DSA shows opacification of the right ICA up to the M1 segment (white arrow). C, Frontal MIP TR-CE MRA shows patency of the right ICA up to the SCICA in the last phases (white arrows). SAA stenosis was classified with DSA as follows: none or moderate in 28 patients (87.5%), severe in 1 (3.1%), and occlusion in 3 (9.4%). All cases were correctly classified on TR-CE MRA imaging (Fig 4). 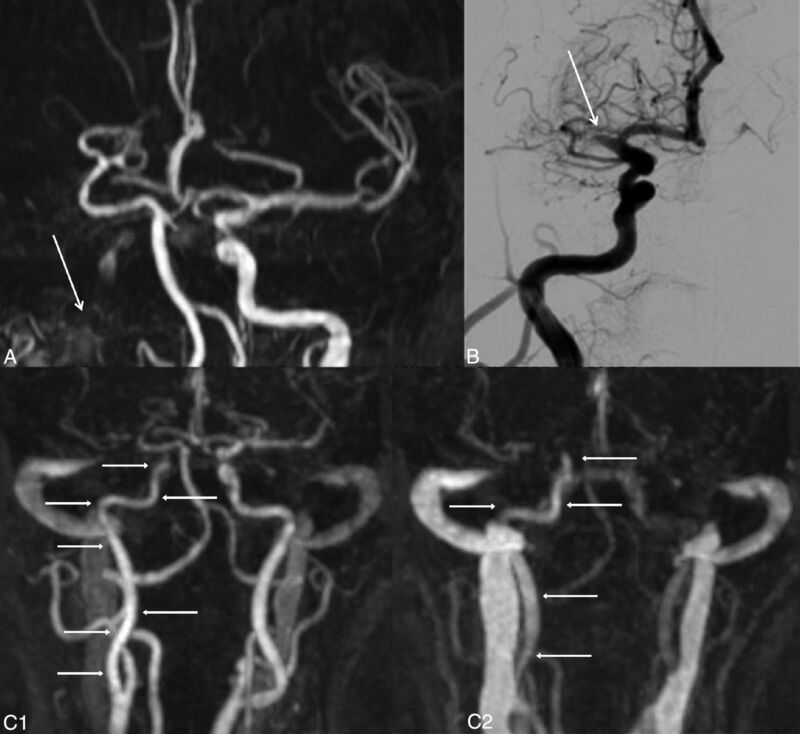 Examples of occlusion and stenosis of the extracranial arteries.TR-CE MRA and its corresponding frontal DSA image. In patient 7 (A and B), occlusion of the left ICA, probably of atheromatous etiology (white arrow) on TR-CE MRA (A) and DSA (B). In patient 24 (C and D), severe stenosis (>50%) of the right ICA, on TR-CE MRA (C) and DSA (D), presumed due to an arterial dissection (white arrow). For 11 of the 32 patients (34.4%), there was a time difference of at least 1 phase between maximum opacification of nonpathologic arteries and optimum opacification within the occluded segment. The difference was 1 phase for 6 patients, 2 phases for 3 patients, 3 phases for 1 patient, and 6 phases for 1 other patient. In 9 of these 11 patients (81.8%), the occlusion location was misidentified on 3D-TOF, in contrast to only 2 misidentified cases with TR-CE MRA. For intracranial artery evaluation, the diagnostic confidence index was significantly higher (P = .013) with the 3D-TOF sequences (mean, 3.0 ± 0.7) than with the TR-CE MRA sequences (mean, 2.6 ± 0.7). Interobserver agreement was considered good for the intracranial arteries visualized with the TR-CE MRA and 3D-TOF sequences (κ= 0.72; 95% CI, 0.48–0.96; and κ= 0.75; 95% CI, 0.53–0.97, respectively) and moderate for SAAs visualized with the TR-CE MRA sequences (κ= 0.41; 95% CI, 0.20–0.62). Our study showed TR-CE MRA to be more accurate than 3D-TOF and GRE T2 for identifying occlusion location, producing excellent agreement with DSA and offering a simultaneous and reliable SAA analysis with no additional time acquisition if substituted for the 3D-TOF sequence and entailing no delay in initiating optimal management. In contrast, TR-CE MRA proved a reliable non-time-consuming tool for occlusion location, with 88% agreement with DSA (κ = 0.81). The superior diagnostic performance of TR-CE MRA compared with 3D-TOF was not hampered by the lower image quality, probably due to the poorer spatial resolution, and may be the result of several factors: First, the T1 effect of gadolinium compensates for the signal loss caused by spin-dephasing that occurs in 3D-TOF when the flows are slow, turbulent, or oriented parallel to the section plane, in this case essentially upstream of the real occlusion site diagnosed on the DSA (standard of reference) image and especially within the IICA segment. Second, during the last phases, the dynamic nature of TR-CE MRA enables identification of the persistent slow-filling artery upstream of and closest to the occlusion. This flow can be missed on 3D-TOF, due to spin-dephasing,13 as well as on conventional CE-MRA, on account of only a single static arterial phase being available, a problem that has already been reported with CT in the setting of cerebral stroke.23,24 Both of these static conventional MRA contrast-enhanced or non-contrast-enhanced sequences, therefore, carry the risk of occlusion overestimation. The advantage of dynamic imaging, as previously suggested in a study based on 4D CT,36 was especially evident in our study. In some cases, we found that TR-CE MRA enabled rectification of the occlusion level that had been misdiagnosed on 3D-TOF due to its added advantage of late phases. Finally, the comparison of TR-CE MRA with the DSA technique in this study also confirmed its reliability for detecting SAA disease, a result that was previously reported.30 The ability of TR-CE MRA to provide simultaneous accurate data in terms of intracranial thrombus location and SAA stenosis during the initial MR imaging in a short acquisition time (<2 minutes) is of particular significance. This advantage clearly means that TR-CE MRA may have the potential to improve patient triage and MET strategy planning. For example, identification of a tandem occlusion enables optimum MET preparation through the use of a triaxial guide-catheter system for stent placement as needed.37 Moreover, advanced knowledge of a critical case as tandem or a very proximal intracranial occlusion can determine the choice of general over local anesthesia. On the other hand, a single M1 occlusion can lead to single-catheter access and local anesthesia, thus resulting in a shorter procedure.38 Last, although a more distal occlusion level in M2 or further is not recommended for MET, overestimation of the level of occlusion (in M1 or more proximally) caused by 3D-TOF may lead to the wrong therapeutic decision. Of all the MR imaging sequences we evaluated, TR-CE MRA proved to be the most reliable for identifying occlusion location in the setting of acute stroke, offering superior performance to 3D-TOF and T2 GRE, along with the added advantage of enabling SAA stenosis detection. Thus TR-CE MRA could replace 3D-TOF and so reduce the interval before optimal management, especially when endovascular treatment is considered. The GRE T2 sequence remains mandatory because it enables hemorrhage identification. The authors thank Aymeric Stamm, MD, for supervising the statistical analysis of this study. This work was supported by the Comité de la Recherche Clinique, Centre Hospitalier Universitaire Rennes (contact grant LOC/10–11). Accepted after revision December 21, 2014.